ATLANTA — Just 28 human cases of Guinea worm disease were reported in 2018, down slightly from 30 cases reported in 2017. When The Carter Center assumed leadership of the Guinea Worm Eradication Program in 1986, there were an estimated 3.5 million human cases annually in 21 countries in Africa and Asia. Of the many diseases that plague humankind, only one, smallpox, has ever been eradicated. Dr. Donald R. Hopkins, who was a key participant in the smallpox campaign and architect of the international Guinea worm eradication campaign and now is the Carter Center’s special adviser for Guinea worm eradication, calls disease eradication “the holy grail of public health.” Guinea worm, polio, and yaws are the only diseases currently targeted for eradication by World Health Assembly resolutions. All 2018 figures are provisional until officially confirmed in March 2019. Although the centuries-long story of Guinea worm disease is gradually coming to an end, the progress took a couple of turns in 2018: While human cases continue to dwindle, Guinea worm infections in animals continue to be reported; South Sudan detected new cases in May during enhanced surveillance activities after going 21 months with no cases reported; and a single, isolated case appeared in Angola, a country that had never reported a case before. Chad: Chad reported 17 human cases in 2018, compared to 15 the previous year. Most animal infections have been found in Chad, where 1,040 dogs and 25 cats were affected in 2018; the number of reported animal infections there has remained relatively steady since 2016 following a near doubling of villages under surveillance. In Chad, Guinea worm disease appears to be transmitted to dogs, cats, and humans mainly by eating raw fish entrails and/or other inadequately cooked aquatic animals such as frogs, rather than via drinking contaminated water as in most other countries. To combat this unusual transmission pattern, Chad’s Guinea Worm Eradication Program is emphasizing treatment of bodies of water with ABATE® larvicide (donated by BASF), burial of discarded fish guts to prevent dogs from eating them and tethering infected dogs until their worms have fully emerged. South Sudan: The 10 cases reported in South Sudan occurred among an isolated group of nomadic herders who responded to a cash reward offer promoted by the national program in newly pacified areas where insecurity had previously limited access. The discovery, which prompted a rapid response from the Federal Ministry of Health and The Carter Center, underscores the importance of ongoing surveillance and cash rewards for reporting and containing possible human cases and animal infections. South Sudan’s program responded to more than 29,000 rumors or reports of Guinea worms in 2018 and investigated 99 percent of them within 24 hours. South Sudan has had only one animal infection, a domestic dog that was reported in 2015. Political and ethnic violence remains a major challenge to South Sudan’s national program. Ethiopia: After an isolated outbreak in 2017, the Ethiopian national program intensified interventions, including stringent surveillance, greater promotion of cash rewards, rapid response to rumors of infections, and aggressive treatment of potentially contaminated water sources, resulting in zero human cases in 2018. Ethiopia reported infections in 11 dogs, five cats, and one baboon, all in one remote district in the southwest. Mali: The Mali Guinea Worm Eradication Program has not reported any human cases for 37 consecutive months; it reduced its number of cases from 16,024 in 1991 to zero in 2016, 2017, and 2018. Mali’s achievements are tempered by two challenges to completely interrupting the disease, namely: constraints to surveillance because of continued insecurity in parts of the country, and recent detection of Guinea worm infections in 18 dogs and two cats. Mali needs to eliminate the remaining infections in animals to ensure continued disease elimination in humans. Angola: The government of Angola, The Carter Center, the World Health Organization, and their partners are working hard to understand how an 8-year-old girl in southern Angola acquired a Guinea worm despite living more than 1,000 miles from the nearest known case and in a country where Guinea worm had never been detected before. Kenya: In 2018, the World Health Organization certified the elimination of Guinea worm disease in Kenya. The last reported indigenous case there was in 1994. The WHO has now certified a total of 199 countries as free of the disease. “What the remaining Guinea worm-endemic communities have in common is that they are difficult to reach and often appear in conflict areas or among remote, marginalized populations. We are working to solve the scientific riddle of the animal infections; the other side of the challenge, human violence, is unnecessary and avoidable,” said Dr. Dean Sienko, Carter Center vice president for health programs and a retired U.S. Army major general. Hopkins, a veteran of several disease elimination campaigns during his four-decade public health career, expressed confidence in the ultimate success of the Guinea Worm Eradication Program. Robust research efforts are underway to help understand the peculiar patterns of transmission among people and animals in Chad, Ethiopia, and Mali, and to seek additional tools for combating the infection. Considered a neglected tropical disease, Guinea worm disease (dracunculiasis) is usually contracted when people consume water contaminated with tiny crustaceans (copepods) that carry Guinea worm larvae. The larvae mature and mate inside the patient’s body. The male worm dies. After about a year, a meter-long female worm emerges slowly through a painful blister in the skin. Contact with water stimulates the emerging worm to release its larvae into the water and start the process all over again. Guinea worm disease incapacitates people for weeks or months, reducing individuals’ ability to care for themselves, work, grow food for their families, or attend school. Without a vaccine or medicine, the ancient parasitic disease is being wiped out mainly through community-based interventions to educate people and change their behavior, such as teaching them to filter all drinking water and preventing contamination by keeping patients from entering water sources. 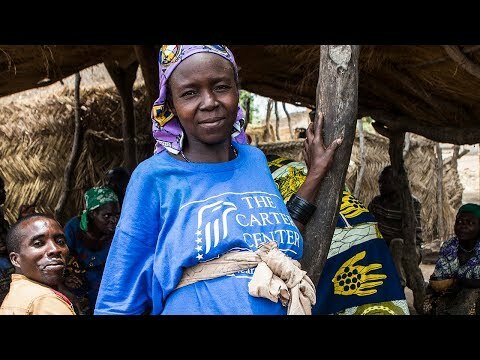 The Carter Center has led the international Guinea Worm Eradication Program since 1986 and works closely with national programs, the World Health Organization (WHO), U.S. Centers for Disease Control and Prevention (CDC), UNICEF, and many other partners. 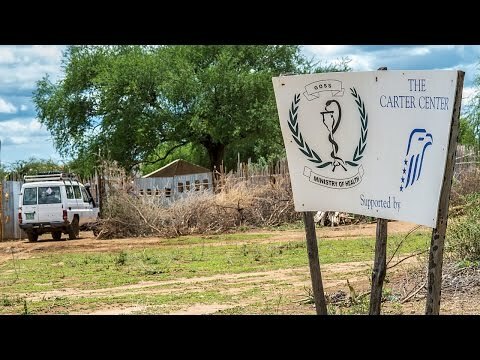 The Carter Center provides technical and financial assistance to national Guinea worm eradication programs to help interrupt transmission of the disease. When transmission is interrupted, the Center provides continued assistance in surveillance and helps countries prepare for official evaluation by the International Commission for the Certification of Dracunculiasis Eradication (ICCDE) and certification by the WHO. The CDC provides technical assistance and verifies that worm specimens truly are Guinea worms. The presence of Guinea worm disease in an area usually indicates abject poverty, including lack of safe drinking water; UNICEF mainly assists countries by helping governments provide safe sources of drinking water to priority areas identified by the national Guinea worm eradication programs. The WHO is the only organization that can officially certify the elimination or eradication of any disease. For a disease to be declared eradicated, every country in the world must be certified free of human and animal infection, even those where transmission has never taken place. To date, 199 countries have been certified; only seven have not. Many generous foundations, corporations, governments, and individuals have made the Carter Center's work to eradicate Guinea worm disease possible, including major support from the Bill & Melinda Gates Foundation; the United Kingdom's Department for International Development (DFID); Children's Investment Fund Foundation (CIFF) - United Kingdom; the Conrad N. Hilton Foundation; the Kuwait Fund for Arab Economic Development; and the Federal Republic of Germany. Major support from the United Arab Emirates began with Sheikh Zayed bin Sultan Al Nahyan and has continued under Sheikh Khalifa and Crown Prince Mohammed bin Zayed. The DuPont Corporation and Precision Fabrics Group donated nylon filter cloth early in the campaign; Vestergaard's LifeStraw® donated pipe and household cloth filters in recent years. ABATE® larvicide (temephos) has been donated for many years by BASF. Key implementing partners include the ministries of health in endemic countries, The Carter Center, WHO, CDC, and UNICEF. What's the Difference Between Eradication and Elimination? Eradication: Reduction of the worldwide incidence of a disease to zero so no further control measures are needed. Elimination: Transmission of a disease is halted in a single country, continent, or other limited geographic area, rather than global eradication.